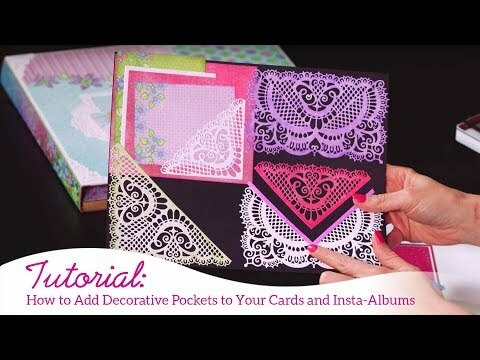 Instructions: Card size: 6 x 6". Fold 12 x 6" white card stock in half and cut the top with the Elegant Pocket Accents Die outer frame to the half way point. Cut a blue decorative 6 x 6" panel the same way and cut the bottom of the blue decorative paper in the same way. Cut 2 full Elegant Pocket Accents out of white. Emboss the bottom half of the card base front only then glue the blue die cut decorative paper to the front of the card. Glue white die cuts to the top and bottom of the blue decorative paper matching edges. Squeeze a dot of white Liquid Pearls at each intersection of embossed design and set aside to dry while making flowers. Stamp Flowers using Vibrant Fuchsia, sponge with Tiger lily in the centers and Vibrant Fuchsia on the outer portion. Die cut and shape in the Floral Basics Shaping Mold. 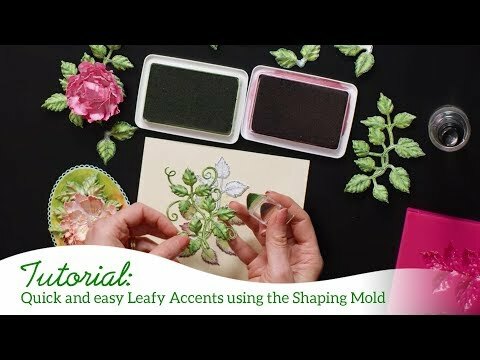 Stamp leaves using Library Green and sponge with Leaf Green and Vibrant Fuchsia, die cut and shape in the Leafy Accents Shaping Mold. Make buds with 1 small flower blossom and yellow small stamen. Make the other flowers with at least 4 layers then insert small and medium stamen. Glitter all flowers, add shimmer to the leaves with Nuvo Shimmer brush. Arrange flowers and leaves around the bottom of blue layer. Stamp the sentiment using Vibrant Fuchsia on white and die cut with the Oval then sponge the edges with the same ink. Glue the sentiment to top right part of card.